On 24 September 2015 Saudi Arabia has witnessed the worst Stampede during Hajj after 1990 stampede. This deadliest incident took lives of as many as 1000 pilgrims and injuring a thousand more. Reaction to this incident was not welcoming especially countries like Iran whose leader Khamenei asked Saudis for apology on mishandling the pilgrims. On the other hand social media had shown outrage to criticise the incident by every means. 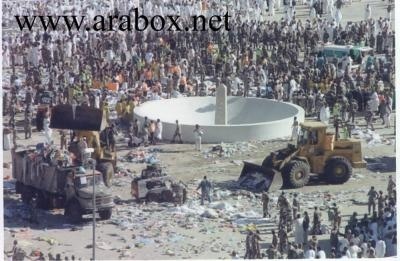 Amidst this criticism a controversial image of stampede has gone viral which shows Saudis bulldozing the corpses of stampede victims. The image was shared and reshared many times on Facebook and Twitter even by some well known celebrities and public figures. 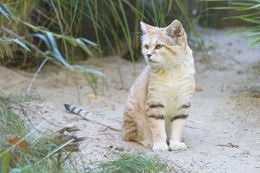 The bulldozing picture has been a source of strong case in favor of critics but to spoil the taste, the picture was fake. This is the image which has gone viral doesn’t even belong to the stampede incident. Firstly it has a water-mark which refers to the website which doesn’t even exist. The site has been renewed on 28 September after many months. Secondly and most importantly the image was up there on internet even before 24 September the day stampede happened. 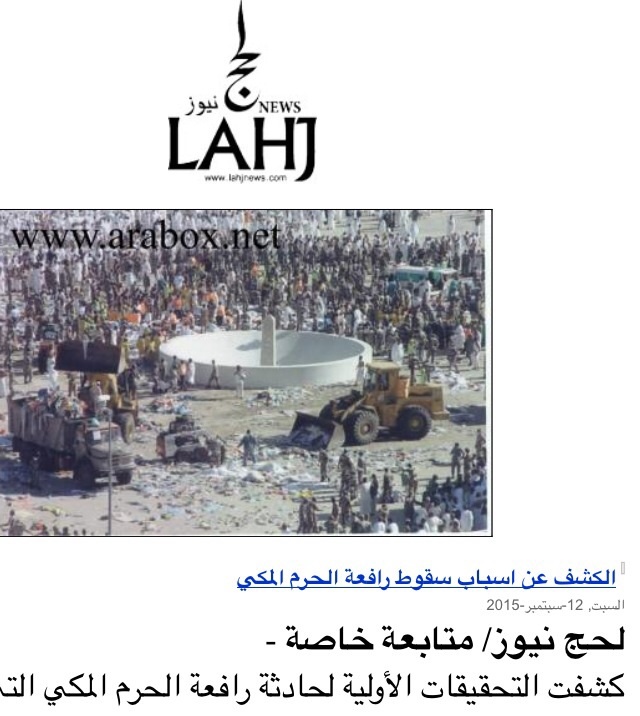 Lahj news which is an Arabic news Media had published this picture on 12 September following the crawler crane falling incident on 11 September. The picture is up on social media even earlier than 12 September anyways which shows it doesn’t belong to 24 September stampede incident. On having a closer look at the image it shows the crane is not carrying the bodies but the raw construction material material. The other image showing people piled off by one side doesn’t prove that they were piled using a bulldozer. Besides the video (mobile made video leaked by a pilgrim) shows when pilgrims rushed, the fell on one another and piled after suffocated to death. Though this incident was a failure of management authorities and mishandling of Hajj duty personnels, the images shared are fake. No authentic source has confirmed the usage of bulldozer to lift the dead bodies. Seventy years are about to pass and we are in grave need of revising our history. Glorifying wars without being accustomed to their horrific consequences is a prevalent norm among our societies. Now two nations India and Pakistan the all time rivals are to celebrate fifty years of a catastrophic battle which lasted for several days resulting mass casualties on both sides. To imagine how horrendous that war was it is enough to state that it was the second largest tank war after the World War Two. There is a more resounding reason to not to celebrate this war, which is the immigration of 40,000 Kashmiris from Indian held Kashmir to Pakistan held Kashmir and other regions of Pakistan. They fled the war hit zone, mostly LOC and its surroundings to seek refuge in a peaceful place. My father was one of those refugees who migrated to Azad Kashmir along with his Family. My grandfather who was known as Qazi, a word for respected members of village there was living a happy and prosperous life before war hit there. Leaving all the luxuries of home, their properties, their cattle and all belongings behind when they reached Pakistan held Kashmir, they had not even water to drink. 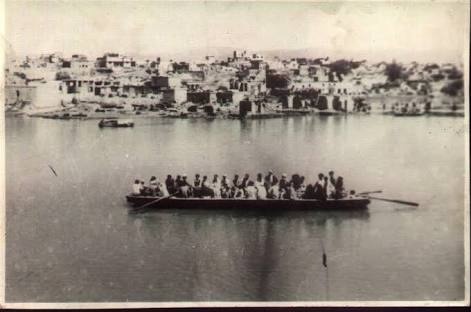 They used to drink water from polluted Mangla Dam reservoir. The hope they came with was the betterment which they never witnessed and till today, after the passage of five decades those immigrants have not seen their hopes come true. From grandfathers to sons and grandsons and now great grandson are yet to get what their ancestors dreamt for. A view of immigrants slums by the bank of Mangla Dam, Mirpur AK. We lost our first generation, ruined the second and now third generation is still facing the consequences of the war-forced migration. Those 40,000 immigrants are about 1 million now after 5 decades and hope what we and our ancestors have faced should never be witnessed by anyone else in the world. This is what wars do to the humanity and we find no reasons to celebrate a war whose consequences are faced by our generations. We expect India and Pakistan start another war. A war against poverty, a war against injustice and a war of peace. Sitara Brooj Akbar youngest in the world to secure 9 out of 9 bands. Sitara brooj Akbar had once made her country proud a few years ago. It was 2011 when Sitara a 10 year old girl owned the record of youngest O’Level degree holder in Pakistan as well as in the whole world. Now in 2015 Sitara achieved another distinction. She became the youngest in the world to secure 9 out of 9 Bands in IELTS. Sitara Barooj Akbar is the young talented girl from Rabwah, a remote city in Punjab Pakistan. In an interview she said that she is inspired of Dr. and she aims to work in the field of research of Chemistry like him and serve Pakistan in the best way for the betterment of the country. This young girl is the symbol of Education and a motivation for the young girls in Pakistan. Itspak Media congratulates her on her achievement. 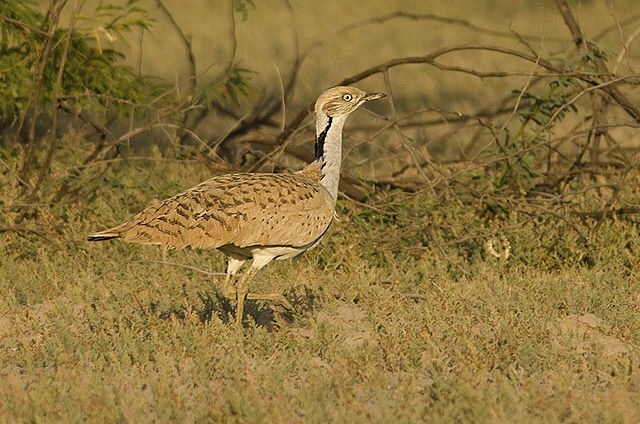 MacQueen’s bustards or Asian Bustards found mainly in Pakistan, in the deserts of Balochistan. These beautiful birds are hunted since early traditions for meat and as a sport which is the major cause for them to become endangered. Markhor is one of the most beautiful wild animals living in Northern areas of Pakistan. Markhor is the National animal of Pakistan. 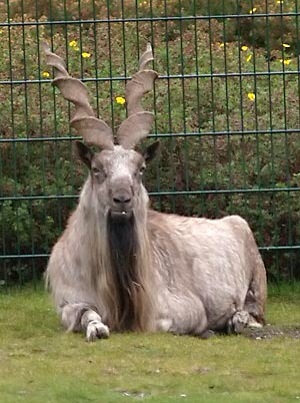 The long curled horns of Markhor give this wild goat a beautiful appearance. 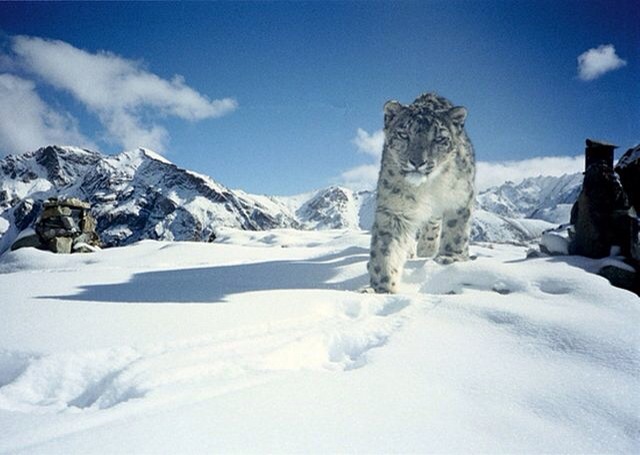 This cute orphaned baby leopard was saved by a Villager in Pakistan in 2005. The Woolly Flying Squirrel is the most interesting animal of this list because it was believed to be extinct since early 21st century until Vladimir Dinets found a couple of them in mountains of Pakistan in 2004. This is the biggest squirrel (1m long) and is found only in Pakistan. It inhabits only in Pakistan. Pakistan is often wrongfully portrayed as a Taliban influenced state by some western Media. The motto of this site has always been to show the world the other bright side of Pakistan which is prosperous and full of life. 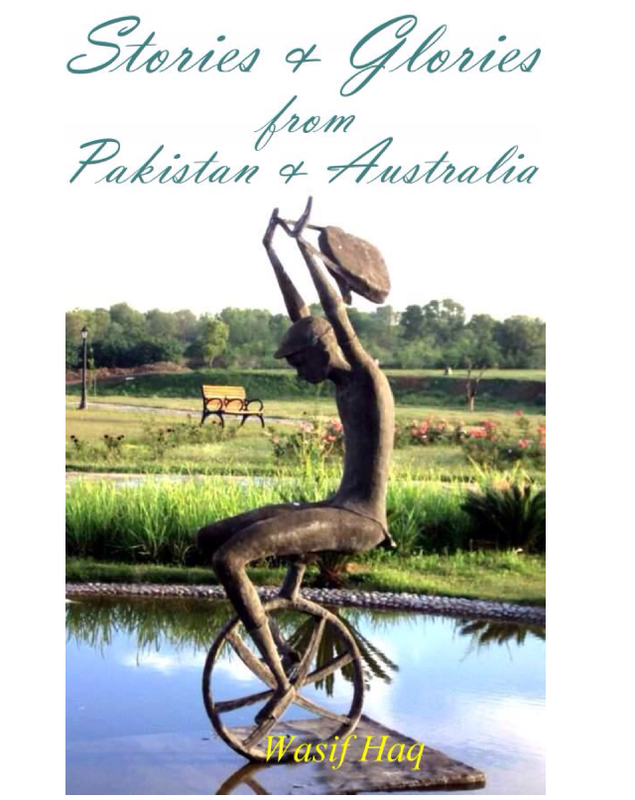 The recently published book, “Stories and glories from Pakistan and Australia” has also tried the same what the aim of this site is. So here is a brief review of this book. The book is written by Dr Wasif Haq is more like a personal experience which he had in different phases of life observing Pakistan. The book comprises of 831 pages and 9 chapters and sub-chapters. The author starts revealing the story in a dramatic way of his journey from Pakistan to Australia when he goes there for higher education. The book is a comprehensive collection of the achievements, glories, events and praiseworthy stories of Pakistan in recent years. The stories which should be praised and highlighted when talking about Pakistan. In chapter 5 Author answers the questions and misconceptions in the minds of Australians about Pakistan in quite appropriate and polite manner. These 800+ pages may look quite long to read at first glimpse but the pictures and their description in a fascinating way made it very interesting to read. The book glorifies many positive achievements in different fields whether they be related to education, sports, development, social awareness, current affairs, politics, and many other niche of Nation’s progress. The book is written in simple English for anyone with English as second language can read and understand it easily. Insha Afsar a Pakistani village girl from Muzaffarabad, a one legged girl competed in US Paralympic Alpine National Championships. Insha Afsar in America. Pic by Dawn news. Insha had lost her one leg in 2005 Earthquake. Insha belongs to an under developed village of Pakistan which is a male dominant society. In 2005 Earthquake in Pakistan tens of thousands of people lost their lives as many as one millions were injured. Among them there was a girl Insha who could easily been destroyed Psycolgically and physically after losing one leg. But this enthusiastic girl never lost hope and reached to such a distinction where world praised her. 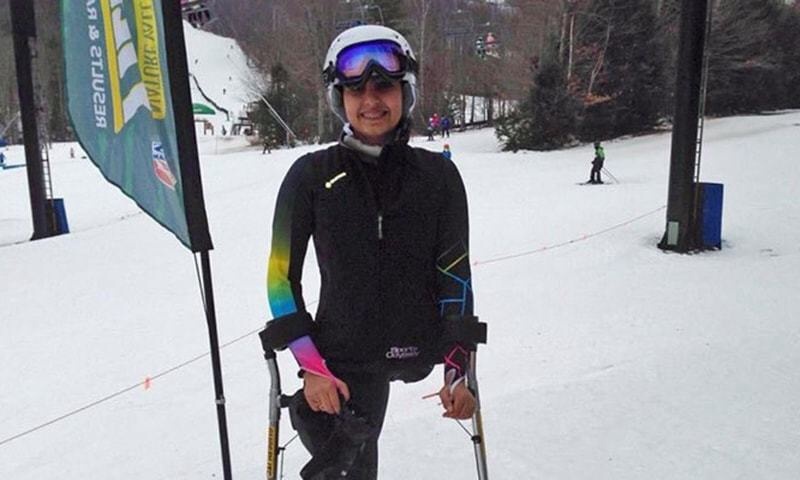 Insha competed in US national Ski championship with her one leg bundles of courage. If such a big tragedy of witnessing worst natural disaster and the loss of an organ and then the pressure of the society cannot let you down, nothing can be. Insha Afsar is an inspiration to all the people especially women who want to to something in their lives. It was the Cricket WorldCup since a couple of months, the biggest event of Cricket sport organised by ICC after every four years. Australia won the WorldCup 2015 and has become the only team to win this title 5 times. WorldCup final was between The host teams Australia and New Zealand which reached WorldCup Final for the first time. Though Australia have won the WorldCup but it left some controversies over host team. As Australian players are well known for their sledging in the game. 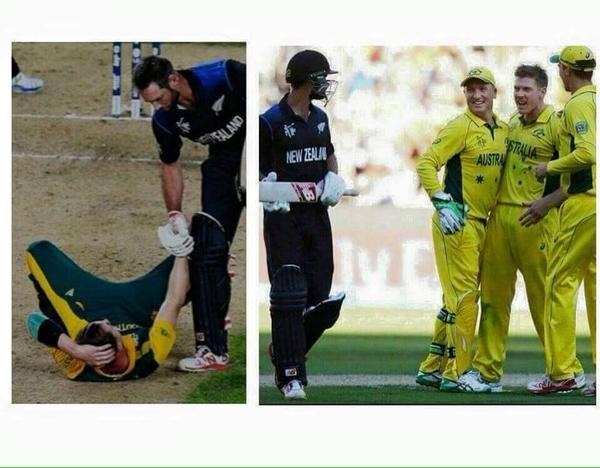 The pic which went viral on social media depicts how Australian players making fun of a Kiwi’s batsmen and compared with the attitude and good manners of Kiwis player. Here is another thing worth quoting that Earlier in the Quarter final an Australian player S. Watson was charged 15% match fee for the violation of code. Anyways! Congratulations to Australian team for winning the mega event. A useful page to like on FB.